Home Unwinding Pettah streets: A hard bargain? Unwinding Pettah streets: A hard bargain? A solution to the chaos at Pettah and removal of pavement hawkers had been an issue for debate for several years. Past governments tried to relocate pavement hawkers and build new areas for them, but such plans were not without faults. Until today, traders have been unable to agree on the allocation of stalls, while the Floating Market had been unable to attract crowds as expected. The by-roads of Pettah are completely occupied while the roads are dilapidated, making it difficult for people, let alone vehicles, to pass. Trading is carried out in a disorderly manner while police raids on illegal businesses and sale of smuggled items are common occurrences. Although consumers hope for better pavements and shopping facilities in Pettah, streamlining the chaos had been a hard bargain for many years due to several reasons. Many trade associations have called for a better system to order the disorder, but it had been difficult for the government to implement it. 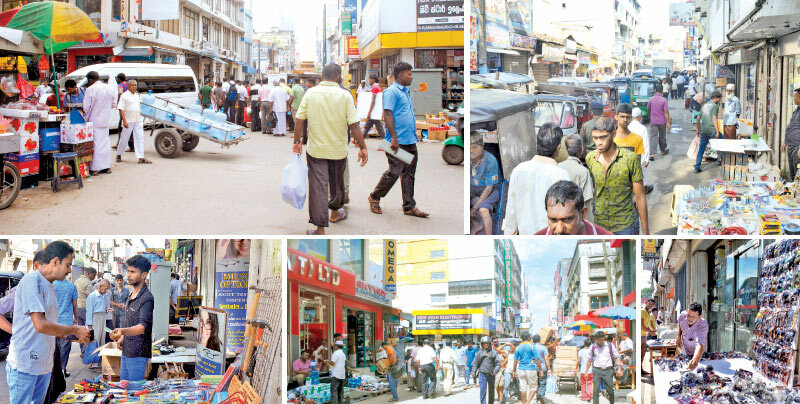 Traders on the streets of Pettah are growing in numbers. The need for convenient locations for trading had been a call of consumers as well as traders themselves, even though better prospects for traders are viewed with suspicion by some. However, the government has assured that solutions would be provided soon to Pettah – its traders and consumers, which would be agreeable to all parties. For consumers, it is a matter of taking a tiresome journey under the hot sun but being rewarded with gems in the rubble for just half rate. The streets of Pettah may be hard to manoeuvre, but it is a place of diversity where anything can be found if one knows where to look. “The past government in 2010 prohibited vendors from carrying out their sales on streets. This ban was in effect countrywide. Agreeing to our request, Pettah pavement hawkers were provided with a trading complex at Bodhiraja Mawatha. At present, 534 traders are carrying out their businesses while another 467 have been unable to agree on the allocation of stalls,” said Federation of Self-Employed Persons Vice President M. K. Joseph Anthony. He added that problems were encountered when mobile traders were moved away from the main streets. The last government provided mobile traders with mini lorries, but they had parking issues and business was slow as vehicles were only allowed to park where less crowds gathered. Later, street vendors were allowed to trade on by-roads instead of the main roads which was a relief for many traders of Pettah. But this was not in effect in other urban areas such as Kandy, Galle, Kataragama etc, Anthony pointed out. Anthony agrees that trading on Pettah streets needs to stop. He requests the government to provide pavement hawkers with a proper place to trade in dignity. “Traders have to fight for a good place on the streets. One day they would be trading at one location and the next day, they would relocate as someone else had taken their place. It is very chaotic especially for mobile traders,” Anthony stressed. Patriotic National Pavement Traders’ Association and Three-Wheeler Drivers’ Association Chairman Ven. Uvatenne Sumana Thera had also been vocal for many years on providing better spaces for pavement traders. “Most traders at Pettah have been there for almost 60 years. Some traders have their own places, but others don’t have a place to trade,” the Thera said. “It is not a methodical system. Traders carry out their businesses in a chaotic environment. There is no proper system,” he added. The Thera said, as the chief incumbent of Bodhirajaramaya, Maligawatte, he came forward to give a voice to the woes of pavement hawkers. “They are self-employed and do not expect anything from the government. Such people need a proper place to do their businesses in peace. Every government promised various things but nothing significant came out so far. Although the previous governments tried to implement a proper system, it was not a comprehensive approach. We have to take examples from places such as India, Malaysia and Singapore and implement a better system for small scale traders on streets,” the Thera added. Although relocating pavement hawkers had been in the offing for many years, some traders are a little apprehensive. They fear that they will lose their businesses and do not want change. Although a chaotic place like Pettah is hard to re-organize, it is a necessary task which has to be done with the consensus of all parties. “A place like the Floating Market has not been planned properly. It is located away from crowds and there are only two access points to it. The railings are dangerous and it is difficult to take children there. The people want to grab something quickly while waiting for a bus and move on. They wouldn’t take the trouble to go to the Floating Market to do that,” Federation of Self-Employed Persons Vice President M. K. Joseph Anthony said. Ven. Uvatenne Sumana Thera pointed out that a new location should avoid all these mistakes. A comprehensive plan should be in place where both consumers and traders benefit. “Wherever a new complex is located, there should be areas where restaurants and refreshments stalls are located. The authorities must think of ways to draw crowds. Simply setting up a building and re-locating traders will not do,” the Thera said. In a place like Pettah where smuggled goods are rampant and counterfeit international consumer items are available for half rate, the ability to streamline and organize Pettah businesses is a big question. Ven. Sumana Thera, however, says that is up to the law enforcement authorities. “The police and law makers are there to investigate into illegal trading. The government has to enforce proper strategies to bring culprits to book. A method must be introduced to standardize consumer goods. Health authorities must ensure food hygiene,” he said. The Thera added that halting the re-organisation of Pettah considering the plight of illegal traders is ridiculous. The government has the responsibility of stopping illegal trading, he pointed out. The Ministry of Megapolis and Western Development is at present drawing up plans to provide better trading conditions for Pettah pavement hawkers. “We discourage traders from carrying out their businesses on pavements. Pavements are for pedestrians. The ministry is drawing up plans to re-locate pavement traders by providing them with better locations without disrupting their livelihoods,” said Minister of Megapolis and Western Development Patali Champika Ranawaka. “Discussions are underway with relevant stakeholders on systematic restructuring of city areas. We plan to make Fort the transport hub of the province. The bus stand and railway station will be brought to one location. There will be a special road to connect the port and the airport. With such changes, Colombo, especially Fort will have a facelift,” the minister said. The changes to Fort and Pettah would redirect crowds, making it possible for authorities to redesign new locations for traders. Even though the Budget does not include redesigning plans for Pettah or pavement traders, discussions are underway, Minister Ranawaka added. He said the Floating Market was designed on aesthetic value instead of taking the needs of consumers into account. It is a failure as it does not draw crowds. The new plans would correct the faults of the past government and provide solutions to benefit both the consumer and trader, the minister stressed. A restructured Pettah and orderly trading activities would indeed be a sight to look forward to. Although it may seem a distant dream, ordering the chaos of Pettah and giving it a facelift is an ambitious project of the government. Trader associations' call for dignity and convenience for small-scale self-employed persons such as pavement traders, need be addressed sooner than later. However, the burning question is whether it would be possible for the government to please everyone. Kariyapperuma Rajendra, 51, has been selling sunglasses at Pettah for about 27 years. He said he comes to Pettah at about 9.30 am or 10 am and sets up his table with his wares. Rajendra says he would like to move to a new and permanent location to carry out his trading. He had been promised a place at Olcott Mawatha and had been paying a rental for a stall for five years as well. However, someone else had encroached there, he said. “I have two sons. My wife does not work. My family depends on me for sustenance. At present, I have no problems with my daily income. Consumers buy my wares. But I will be happy to move to a better place rather than stand in the hot sun every day,” Rajendra said. D. D. Priyadari had come to buy wedding cards for her daughter’s wedding. She said she frequently comes to Pettah to buy items at reasonable rates. “I come to Pettah because of the reasonable prices and there is a range of products that we can choose from. You would not see such variety in other places,” she said. She admits that moving through Pettah streets is difficult, but says it is worth it. “I came to buy cards. But I bought other things that caught my eye,” Priyadari said, adding that the diversity of goods usually tempt her. B. Siriyawathie, 64, who sells glue, does not have a stall or a wooden plank to keep her wares. She carries her goods and stands on the pavement from 9.30 am to about 3 pm. “I don’t have a place to sit. I don’t have any other choice but stand and sell my wares. By afternoon, I am unable to keep standing anymore. So I go home at that time,” Siriyawathie said. When the police removed pavement hawkers on main streets, Siriyawathie had to come to 2nd Cross Street. “The police can’t remove me as I am selling my wares while standing. I would like to have a permanent place for trading,” she said. "The Federation of Self-Employed allocated a stall for me and I even paid them. But I never got a stall," she said. M. I. Fowzie, 45, is from Hatton. He comes to Pettah at least once in two months. On this day, he had come to buy some clothes and a mobile phone. “There is freedom to choose at Pettah. The price is good," he added. "I travel all the way from Hatton to come here because I like Pettah,” he said. Fowzie added that there is a culture in Pettah that he would miss if traders are shifted to a new location. He said he likes the way things are at Pettah. “For many years and decades, people are used to 1st Cross Street, 2nd Cross Street etc. "I am happy to wonder around on these streets as I discover rare items for very low prices. Walking on these streets is not difficult if you get used to it. I like walking on these lively streets,” he said. S. G. M. Imitiyaz, 49, sells kitchen utensils among other knick-knacks. He had been trading on Pettah pavements for about 20 years. Imitiyaz had been paying the Federation of Self- Employed for several years for a stall but he is still trading on the pavement. “I have two sons and a daughter. My wife does not work,” he said. “I actually think that the spot where I do my business is better than a stall located elsewhere. Crowds gather here. People may not come to Pettah to buy my wares. But when they come for other things, they see that I sell something interesting and people stop to buy it,” Imitiyaz pointed out. He added that if a permanent, well-organised location is given for pavement traders, the authorities must allocate stalls for a lot of traders. Only then will people come to the new place. They would even like to wonder around and stop to buy something that they did not even intend on buying. Ramani Athukorala, 55, has travelled from Kandy to see her daughter who lives in Colombo. While getting off the bus, she had taken a tour around Pettah to buy something for her daughter. “I come to Pettah twice a month. I travel by bus or train and get off here. It is easy for me to step into Pettah, look around and take another bus,” she said. Athukorala said sometimes it is difficult for young girls to go to Pettah alone. “Girls could be harassed. If there is a better place for pavement traders, I’m sure this would lessen,” she said. “When I walk around, I see interesting items. I like to walk on the streets as there is a lot of variety. You may never know what you will find. It is however, difficult to walk on dilapidated roads in the dirt. Some shopkeepers throw their waste on to the streets, which becomes difficult for shoppers. Other than that, pavement hawkers don’t bother me,” she added. G. Gunatilake, 62, is from Matara. He has made a home-made product of plastic fish. “I have been on Pettah streets for about 12 years. This is what I sold during all these years. I have a machine at home where I manufacture the plastic fish. My family helps me,” he said. Gunatilake stands from 10 am to 4.30 pm on 2nd Cross Street selling his wares. He does not have a place to sit or set up a table. “I was promised a stall on Malwatta Road but I never got it. Where ever authorities establish stalls, it should be a place where crowds gather. Otherwise, it will affect our business,” he said. “I have been able to carry out the same business because I was creative. This is my own product,” Gunatilake said proudly displaying his plastic fish. “Children like this as it is colourful and it is an activity for them. I work hard and it is paying off,” he said.